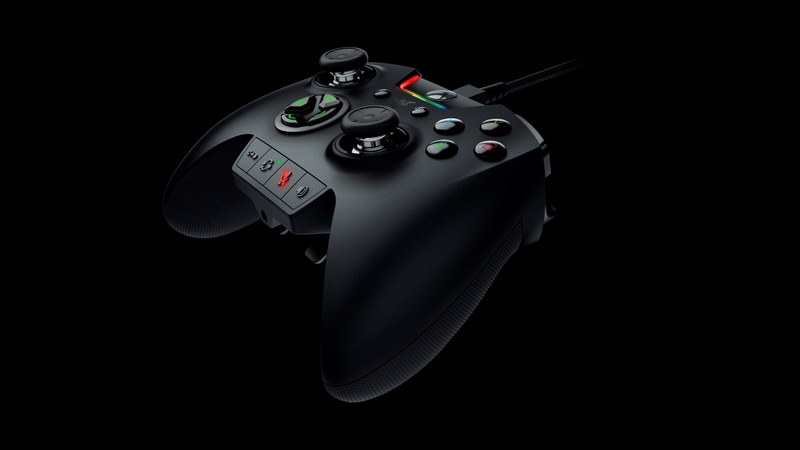 The Razer Wolverine Ultimate appears like a wired hybrid of the both the Razer Wildcat and the Xbox One Elite Controller. The toggles for the triggers are still there, allowing you to alter the actuation points for the trigger pulls. The 3-meter (10-foot) threaded cabled, also seen in the Razer Wildcat, makes a reappearance as well. Subtle changes come in the new grip style and the inclusion of interchangeable D-Pads and analog sticks. The once optional grips are now a part of the controller, placed similarly to that of the Xbox One Elite’s. Where the Razer Wolverine Ultimate makes itself significantly different from the others is in its addition of even more mappable buttons and now customizable LED’s. The Razer Wolverine Ultimate now houses six mappable triggers and buttons on top of all of the standard Xbox One buttons. The LED lighting strip will be controllable via the Razer Synapse for Xbox app, giving you 16.8 million color options and slew of lighting effect choices. The Razer Wolverine Ultimate will also support the Razer Chroma SDK, which will allow games to give lighting feedback through the controller, should game developers choose to use this functionality. This is looks like a nice little add-on to the Razer console gaming family. The Razer Wolverine Ultimate has most, if not all of the functionality that the Xbox One Elite Controller currently has. In a straight-forward approach, adding more buttons mean more possibilities. Don’t want to map those buttons for your Xbox One? Connect the Razer Wolverine Ultimate to your PC for when you need to play games with semi-complex vehicle controls, such as flying planes in any number of Battlefield games. The Razer Wolverine Ultimate joins the console fray with the Razer Atrox fight stick and is an interesting introduction after the Razer Thresher Ultimate that we enjoyed so much. The Razer Wolverine Ultimate will run for $159.99 / EU €179.99 and will hit Razerzone.com in September 2017 as well as global markets in Q4 2017. You can check out the Razer Wolverine Ultimate for yourself here.